China Telecom will hope that the iPhone 4S launch on its network next week will close the gap with its nearest 3G rival. NEW YORK ( Trefis) -- China Telecom ( CHA - Get Report) announced last week that it added close to 2.8 million subscribers in January, about 87% of which subscribed to 3G. The company now has close to 130 million subscribers and is a distant third behind China Mobile ( CHL and China Unicom ( CHU - Get Report). But the gap is narrow when it comes to 3G. China Telecom will hope that the iPhone 4S launch on its network next week will close the gap with its nearest 3G rival, China Unicom, which launched the 4S last month. See our complete analysis of China Telecom here. At less than 14%, 3G penetration in China is very low. This gives small wireless carriers such as China Unicom and China Telecom more opportunity to compete with China Mobile. With more than 650 million subscribers, China Mobile is the largest wireless carrier in the world and has three times as many overall subscribers as China Telecom. But when it comes to 3G, the advantage is less clear. As of January, China Mobile had around 54 million 3G subscribers compared to China Unicom's 43 million and China Telecom's 39 million. Leading the 3G race currently is China Unicom, which has been adding the most number of 3G subscribers on a monthly basis. Not only is China Unicom the only carrier to sell the iPhone for now, it also started the trend of selling lower-cost 3G smartphones in China. Adding 3G subscribers will help China Telecom increase its ARPU levels as 3G smartphone users are huge data users as well. But the subsidies associated with selling an expensive smartphone such as the iPhone to drive sales will cause its margins to contract. 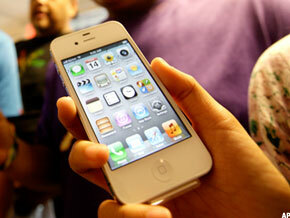 China Telecom announced that it is planning to offer the iPhone 4S for free with a two- or three-year contract. This, along with increased marketing spend on promoting the phone, will have a near-term pressure on the margins. We have seen China Unicom's EBITDA margin for its mobile division decline sharply since the end of 2009, when it first started selling the iPhone. But its ARPU levels have also increased sharply since then, pointing at the long-term benefits of subsidizing 3G smartphones. Moreover, the strategy of selling low-cost smartphones alongside the iPhone will provide some relief to the margin pressures.